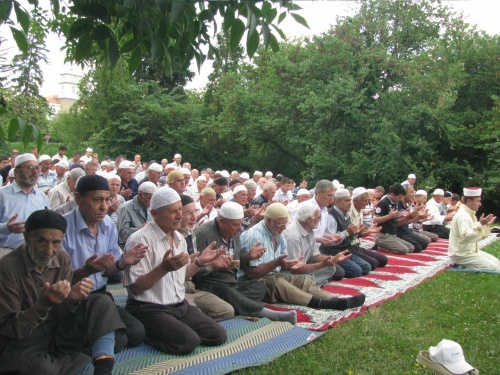 Muslims from all the 18 regional Mufti Offices in Bulgaria have participated in an unprecedented prayer on Friday as another peaceful protest against the reinstatement of Nedim Gendzhev as the Muslim religious leader in Bulgaria. “We are very disturbed by the decision of the Bulgarian Supreme Court of Cassation to bring back Nedim Gendzhev as a Chief Mufti. A while ago, around 1 000 Imams gathered to protest in Sofia. Later this happened again in all regional Mufti Offices in the country. But nothing has changed. The Court has taken a decision in the name of people, but the people are not happy with it,” the regional Mufti from the Bulgarian city of Kardzhali, Bejhan Ahmad, said Friday. This is the third peaceful protest of the Muslim society in Bulgaria after the Court's ruling from May 12. At the beginning of June, around 1 000 Muslims participated in a rally, which started in front of the Sofia Mosque, walked by the Presidential and Council of Ministers buildings and ended in front of the Parliament. The second protest from June 18 gathered Imams and regular Muslims from 23 Bulgarian cities and towns. “We are firmly staying behind the current directorate of faith, which is the Chief Mufti Mustafa Ali Hadzhi and the President of the Supreme Religious Council, Shabanali Ahmad. We did not choose Gendzhev and we will never support him. We will use all the rights, granted to us by the Constitution. Our peaceful protests will not stop,” Mufti Ahmad said. In October 2009, the National Muslim Conference decided to elect Mustafa Ali Hadzhi as Chief Mufti. However, Gendzev appealed the Conference's vote and the Bulgarian Supreme Court of Cassations decided to reinstated him as Chief Mufti in May. The muftis has issued a declaration that Mustafa Ali Hadzhi is the only legally elected Chief Mufti in Bulgaria. They were saying they will send the declaration to the Parliamentary Assembly of the Council of Europe, the European Parliament, The European Commission, the President, Georgi Parvanov, the Speaker of the Parliament, Tsetska Tsacheva, the Chairs of all Parliamentary Groups, the Constitutional Court, the Supreme Judicial Council, and the Ombudsman. Mustafa Ali Hadzhi declared the Court is showing disregard for the vote and the wish of the people, and has been influenced by external factors, adding the Muslim community in Bulgaria will continue its fight for justice. Gendzhev is notorious in Bulgaria over allegations of trading in political influence and Prosecutor's charges of illegally withdrawing huge sums from the accounts of the Chief Mufti Office. According to the regional Mufti in the Bulgarian city of Pleven, Hadzhi Nedzhiatin Mustafa Nedzhip, Gendzhev is also trying to bring back the Revival Process, which was a campaign of the former Communist regime, during which the Muslim's native names have been replaced with Bulgarian ones. Nedzhip believes that Gendzhev is also trying to eliminate the creed, so that the Muslims cannot profess their religion freely, adding that Gendzhev has sent letters to the municipalities all over Bulgaria to ask for demolishing Muslim board of trustees.